What is StaffCounter for Android? 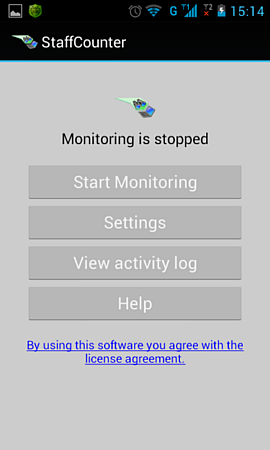 StaffCounter for Android is a program for monitoring telephone activity. 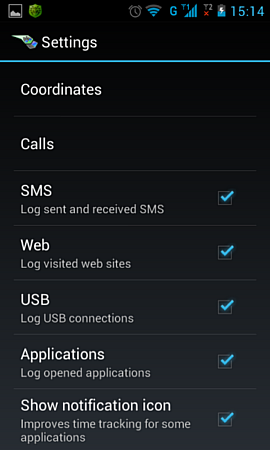 It logs the user’s activity on the phone and sends this data to the StaffCounter server. it tracks the user’s web use, namely the addresses and the amount of time he/she spends on sites. it writes all activity to a log file and sends it to the data.staffcounter.net server (optional). Download the StaffCounter program from data.staffcounter.net to the Android phone or tablet. Because this program is not offered through the Google Play app store, you must allow installation of apps from unknown sources before installing StaffCounter (go to Settings > Security > Device administration and check the “Unknown sources” option). After installation, the StaffCounter icon will appear in the list of applications. In the main window you can start or stop monitoring with the Start/Stop button (this will always appear in the log file). The Settings button allows you to change the program configuration, connect the monitoring agent to the data.staffcounter server, and enable or disable monitoring options. 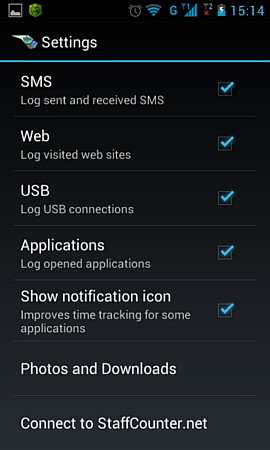 By clicking on View activity log you can view the user’s activity locally without sending the log to the server. By clicking Help, you can get help on using the StaffCounter program. Here you should check the features you want to enable for monitoring. For properties that do not have a checkbox next to them, this means that another window will open with additional settings. Go up the list of properties and click on the option Connect to Staffcounter.net. If you want to have log files uploaded to the data.staffcounter.net server for remote access and analysis, set the option Upload log files. Click on StaffCounter account and, in the text field that appears, enter the e-mail address which you use to log in to your user profile on data.staffcounter.net. As you exit the settings, don’t forget to restart the program. To uninstall StaffCounter, follow the standard uninstallation procedure for all Android applications. Open Settings > Applications > StaffCounter and choose Uninstall.